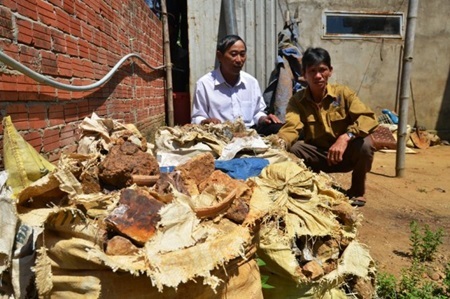 People in the central Quang Nam Province admitted they had been doing things that were wrong. They had been taking rock that has gold in it from a gold mine to get the gold out themselves. However, they handed this rock over to the authorities. HA NOI (VNS) — Authorities have destroyed 10 tonnes of gold ore from the Bong Mieu gold mine that were handed over by Tam Lanh Commune residents in the central Quang Nam Province. It was the first time the residents had handed over gold ore that had been illegally taken away from the mines. "Tam Lanh is the first locality in Quang Nam to urge people to hand over gold ore and not to mine gold illegally," Chairman of Tam Lanh Commune's People's Committee Nguyen The Vinh said. This movement was launched by local authorities to reduce environmental pollution in residential areas and the number of people illegally taking ores to pan for gold. Tam Lanh Commune is considered a "hotspot" of illegal gold mining. About 200 local people – or 30 per cent of the population -- in the commune's Bong Mieu hamlet search for gold ores in the mines. Nguyen Thi Sau from Bong Mieu hamlet said her family has been earning a living mainly by taking gold ore from Bong Mieu gold mine to pan for the yellow metal for almost five years. She makes VND150,000 to VND200,000 (US$7 – 9) per day. Authorities have destroyed 10 tonnes of gold ore from the Bong Mieu gold mine that were handed over by Tam Lanh Commune residents in the central Quang Nam Province. Gold ore is rock that contains gold. People who take gold ore away from the mines illegally break the law when doing so. To urge means to encourage. When environmental pollution is reduced, less rubbish like garbage, chemicals and smoke goes out into the air, the rivers and the forests. Residential areas are areas where people have their homes. To pan for gold means to look for gold by using a pan filled with water to separate the gold from the gold ore.
A hamlet is a very small village. 1. Nguyen Thi Sau is Chairman of Tam Lanh Commune's People's Committee. 2. Bong Mieu is a large city. 3. Residents of Tam Lanh Commune had often handed over gold ore in the past. 4. Authorities destroyed the gold ore after it was handed in to them. 5. Panning for gold earns people between VND150,000 to VND200,000 a day. 1. False; 2. False; 3. False; 4. True; 5. True.